Air Radiators’ innovative product range can be seen through its new patented Alu Fin heat transfer product. Alu Fin heat transfer packages are constructed with flexibly mounted individual finned aluminium tubes. Replacing traditional bolt-on and fully brazed heat exchangers, Alu Fin packages allow greater design flexibility and increased service life. Engineered design smarts including thicker leading-edge tube walls for strength, custom compound rubber grommets for increased hydrocarbon and temperature resistance in both hot and cold climates and reducing vibration transfer translate to longer life and less servicing. Improved thermal performance through multiple tube and fin pitch combinations, coupled with reduced pressure drop across the heat exchanger surface means no more compromises when designing a radiator package. Alu Fin is a super durable, low cost, lightweight product with increased design possibilities. Due to the individual tube, the product is low fouling and easy to clean being important in the arduous, dusty conditions. It also means low service downtime as there is the ability to repair or replace at any site. 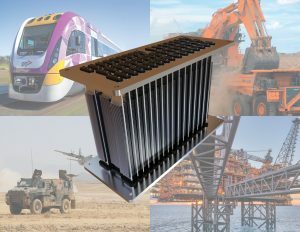 This product is currently being used in rail, defence and trucks.